Wall Street Hippies (Part 3) - How I Stopped Worrying and Learned to Love the Income Gap! A friend of mine posted this chart on FaceBook recently (a real friend, not just someone I know through FaceBook). He found it at Mother Jones. He made the point that these "Occupy Wall Street" hippies are mostly about envy. I'm sure that he is right. What I'm not sure of is whether they'd be happier being wealthy enough to be in one of the red/orange/yellow squares ... or, whether it would make them much happier to have everyone in the blue. I suspect the latter. Socialism, after all, is not about causing everyone to have plenty; it is about spreading the misery around equally. And the Wall Street Hippies have concluded that those in the top income brackets are not carrying their fair share of misery. But I find at least two objections to this chart and the realities behind it. The first is that the Mother Jones / Wall Street Hippie thinking depends upon this being a Zero Sum Game. In that view of things, there is a fixed amount of wealth in the world, and the only question is how to divide it up. It would be like having ten of your friends over and ordering a medium pizza. It wouldn't seem fair for one fellow to have eight pieces while the rest divide up the remaining two slices of pizza. But the point is, there is no limit on how large the pizza can get. In reality, you are able to order an Extra-extra-extra-extra Large pizza. And then, even if you divide it unevenly, everyone has plenty. The economy is not a Zero-Sum Game. Wealth can be and is being created. The pizza is getting bigger. How does the total wealth of the world increase? It increases by commerce, but mainly by genius, inspiration, perspiration (hard work), patience, faith, and by people diligently and zealously pursuing their vocations. I would be willing to wager that 99% of the Wall Street Hippies have more expensive and more capable cell phones than my family has. Our Century has the richest poor people in the history of the planet. How I Stopped Worrying and Learned to Love the Income Gap! And here is the other main point. 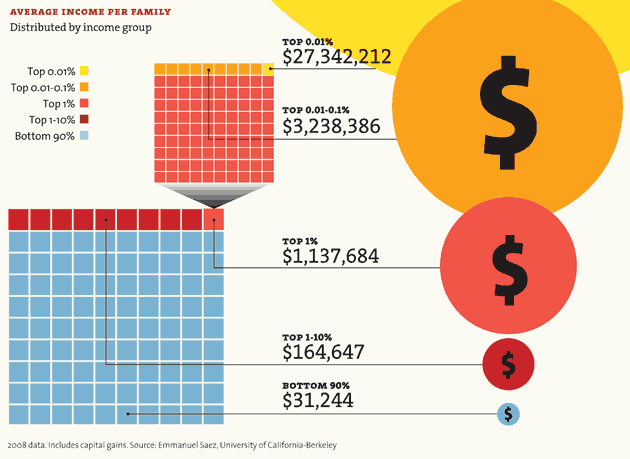 The folks at Mother Jones and the Wall Street Hippies create (or most likely, just find; creating is too hard for them) charts like this to prove one main point: The rich are getting richer and the poor are getting poorer. "For I say unto you, That unto every one which hath shall be given; and from him that hath not, even that he hath shall be taken away from him." I put that in red font, because those are the word of the Lord Jesus Christ himself. You can read the context here in St. Luke's Gospel the 19th Chapter. Maybe it seems odd to you that it should be this way. But it inevitably is. "You would expect those who had not done the homework to study more on the night before the Final Exam. But you would be wrong. It is precisely those who have been diligent all throughout the semester that you will find still toiling away, perhaps unnecessarily, the night before the Final. For I say unto you that unto every one which hath shall be given; and from him that hath not, even the little he hath shall be taken away."